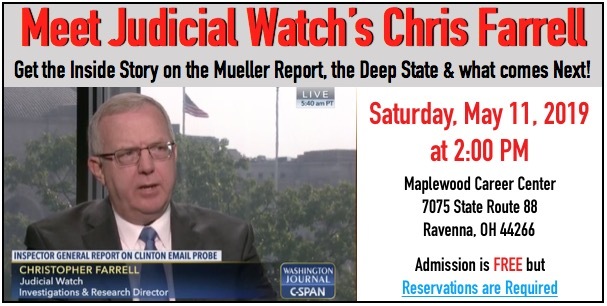 Meet Judical Watch's Chris Farrell, Director of Investigations and Research, and get the inside story on the Mueller Report, the Deep State attempts to elect Hillary Clinton and destory President Donald Trump, the evidence of Russia and Ukraine "collusion" with the Clinton Foundation and the Clinton Campaign, and much more. No person has seen more real evidence of Deep State corruption or can put all the pieces together like Chris Farrell who leads the investigate team that has produced all the documents that you hear Tom Fitton talk about on national TV nearly every night. If you care about the future of our Republic, and "Equal Justice under the Law" for ALL Americans, don't miss this afternoon with Chris Farrell. It will be an event you will never forget! Make your Reservation NOW as seating is very limited for this event.